Parfum 5 is Gingembre by Richard Ibanez of Robertet, and has notes of grapefruit, saffron, baie rose, nutmeg, ginger, incense, patchouli, vanilla, and amber. I love the effervescent top notes: tons of ginger and pink peppercorn, and a bright, sparkling grapefruit softened by the saffron. Although they have nothing in common other than the citrus and peppercorn, it is reminiscent of Hermès Rose Ikebana, but softer and spicier. It calms quickly to a lightly spicy fragrance with a hint of resins. The grapefruit lasts well into the dry down, but the sparkle is gradually obscured by sweet notes. This one was a close call, if it were a bit drier I would have loved it. 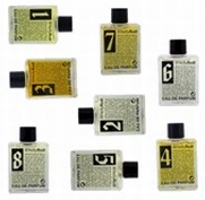 Parfum 6 is Bois by Amandine Marie, also of Robertet. It features cardamom, caraway, clove, birch, patchouli, leather, cedar, vetiver, sandalwood, amber, and musk. Bois starts with spicy top notes over a rich wood base, and dries down into a smooth and earthy wood scent with hints of soft leather. It is very nicely done; there is a bit of sweetness but it is more under control here than in some of the others in this set. Easily the winner of this batch. Parfum 7 is Ambre, by Dorothée Piot of Symrise. The notes are amber, vanilla, and musk. This is a simple, mildly sweet blend that smells pretty much like what the notes would suggest. It gets nicely resinous in the dry down, and would probably layer well with some of the others in this set, but I am not an amber lover and would not wear this on its own. Parfum 8 is Rose, again by Dorothée Piot, and has notes of bergamote, coriander, cardamom, rose, ylang, mimosa, cinnamon, caraway, musk, civette, and vanilla. I very much regret that I fell behind in my testing schedule this week and only managed to try this fragrance once, as it may turn out to be the most interesting and unusual of the set. It starts sweet and spicy; the sweetness calms considerably as it dries down to a soft floral-spice blend. The rose is the predominant floral note, but is nevertheless subdued — it is more likely to appeal to someone who loves soft spices than someone who is looking for a big rose fragrance. I will be giving this another try later. My final verdict? This is not a must-have set for me, but I am not an oriental fan so I did not have high expectations. However, I enjoyed trying these, and the only one of the 8 that I really would not wear is Incense, and please note that both Victoria and Tania loved that one. I would think that a lover of sweet orientals would appreciate this set much more than I did, and I regret that I did not have the time to explore some of the layering options. If NellyRodi's intention with this set was to predict the coming trends in perfumery, I would say we are in for another rash of sweet fragrances. I still love the overall concept and hope that they will do another fragrance family next time. For more opinions on Scent Factory, see Victoria & Tania's reviews on Bois de Jasmin. For buying information, see the listing for NellyRodi under Perfume Houses. Aha! Now we are talking. I want to at least try each of these 4, especially Bois and Rose. After reading your descriptions, I may even purchase unsniffed. So what if I am not interested in the first 4, right? Sweet and spicy rose…I cannot resist that decsription. Great reviews – you enabler! I do want to want to try Bois and maybe even the rose. The weirdest thing has been happening – I love rose perfumes more each day. Yes, Bois and Rose are easily the winners of this batch. Nevertheless, Rose dried down too sweet on my skin, with too much vanilla. I would have loved a spicier interpretation. Would love to see what other sets they will come out with. M, If you are not interested in the first 4, you can always send Cardamome to me, LOL!! N, You can't accuse me of enabling when I said I wouldn't buy it! HA! On the BTW: thank you so much, dear N, you are always so encouraging! I know but your enabling descriptions makes me want to test them very soon! Oh R dear – I was so happy this morning reading the articles. N, I should think these are readily available in Paris? V, I really liked the caraway & cinnamon, but hate to review something I've only tried once. It is a shame Rose happened to be number 8 so that I got to it last…didn't notice so much sweetness as you did but first impressions can be deceiving. R., you've got a deal! Always read the small print, LOL! Actually one of the things I like about this set is that it is perfect for a swapper or an ebay seller….you don't have to feel “stuck” with the ones you don't like. P.S.–Totally off topic, but do you, or anybody else kind enough to read this palaver, know of anyone who has tried that Mandarina Duck fragrance? The notes sound wonderful, and I love those cheerful yellow bottles, but I can't find any reviews of it on makeupalley. You swap, dear, you swap! They are less than $20 a bottle so should be easily swapped. All the same, I am also waiting for the next trend-spotting theme, which hopefully will be something more to my liking than orientals. There are a couple of comments, good & bad, about the Mandarina Duck under that article, but it isn't in the States yet so I doubt many here have tried it. You have a great weekend too R! Yeah, you swap, but you know how that can go, girlfriend! Afterall, these fragrances aren't the caliber of Hermessences, and there are eight of them for goodness sake! LOL! Think I'll focus on the MD comments below. Here I go to read them! R, I really enjoyed reading different opinions on the fragrance-set. Just from reading – I think NellyR isn´t available in Europe or if so, I don´t know about it. I emailed them, but I didn´t get an answer… – I would vote for Incense, Bois & well – yes: Rose. I really like orientals so I should like these, too. But as I wrote earlier, I don´t know if I purchased them if I had the possibility – but I would be very tempted to try them! But you can´t compare them to the Hermessence set, can´t you? Yes, I must admit that swapping doesn't always work out the way you planned. I wish I had the time & energy to sell on ebay, but I don't. No, I would not compare them to the Hermessences, but then, there are many things that I wear quite happily and cannot compare to the Hermessences! R, I just got perfumed ribbons from Hermès to give me at least an impression on the Hermessence fragrances – since both are fragrance-sets I wondered if the Hermessence line is more sophisticated, that´s why I asked. Done, and again, my apologies for this dratted commenting problem! I definitely find the Hermessences more sophisticated. That is one set I would not be afraid to recommend buying unsniffed…all 4 of them are so worth trying, and the set of 1/2 oz sizes is very worth the price. LOL — not everyone reads every day, so I'm sure I'm not the only one who sees your comments, Alia! On the Mood series, I have only tried “Joyful Mood”, which smells just like strawberry bubble gum. It is not long lived. Sorry I don't know when these came out!